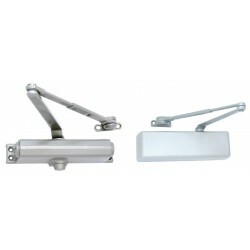 Commercial Locks including aluminum entrance locks, pushbutton locks, deadbolts, knob sets, lever sets, mortise locks, electric strikes, exit devices, door closers, file cabinet and furniture locks, key cabinets and accessories, padlocks, and mailbox locks. Commercial Locks There are 33 products. 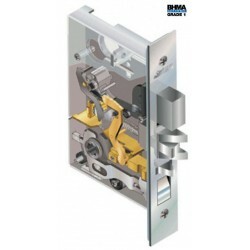 Many different types of locks and locking mechanisms are available to use with commercial aluminum store doors. Some use a key on both sides to lock or unlock the door, some allow the door to open from the inside by pushing or pulling the paddle or exit device, and others operate with access control systems. Most deadbolts must be manually locked with a key, and are more secure, as they have a 1” throw on the deadlocking bolt. A deadbolt may be either a single cylinder or double cylinder. 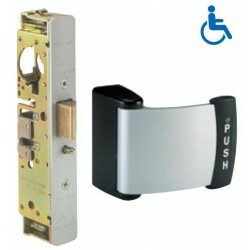 A single cylinder deadbolt will accept a key on the outside of the lock, and is operated by a thumbturn on the inside. 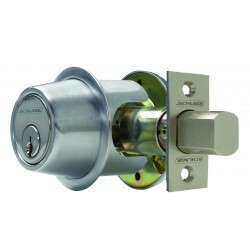 A double cylinder deadbolt will accept a key on the inside, and outside of the lock. Knob Sets are the most common form of lock, and are the most widely used. 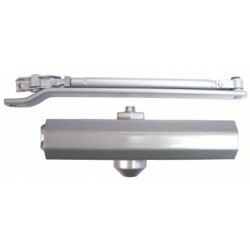 Knob Sets operate by physically turning the knob, and retracting the latch, allowing the door to be opened. In some cases it is difficult for some people to turn the knob and a lever set is used. They are available in various functions, designs, and finishes. Lever Sets are becoming the most popular choice, and sometimes required for commercial applications. By simply pushing down or pulling up on the lever itself, the latch is withdrawn and the door may be opened. They are very easy to use for children, and the elderly. They are available in various functions, designs, and finishes. An electric strike replaces the standard strike faceplate in the door frame. The electric strike can be opened upon demand, allowing the door to be pushed open without being physically unlocked. 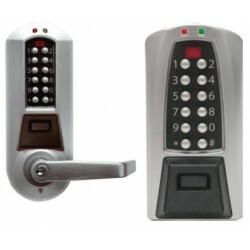 These are mainly used in access control systems. An exit device is used to unlock a door during an emergency. 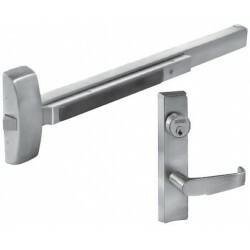 It is a spring-loaded metal bar attached horizontally to the inside of an outswinging door. When the bar is depressed it activates the mechanism and unlatches the door, allowing the door to be opened. These doors can also be opened from the outside, if a trim piece or key cylinder is added. They may also be dogged open from the inside to allow access from either side. File cabinets, cupboards, desks, showcases, etc. are used to secure, organize, store, and display documents and valuables. 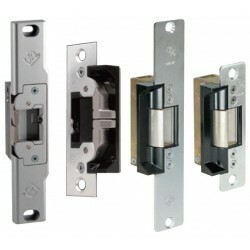 These cabinets have many different types, functions and designs of locks. Mailboxes are used to receive incoming mail for a business, or private residence. Many different mailbox units, as well as locks for existing mailboxes are available. Many doors use Pushbutton Combination Locks which require the user to enter a numeric sequence on a keypad to unlock the door. These are available in mechanical gear driven combination locks, as well as electronic combination locks. A mechanical combination can only have one combination at one time. An electronic combination lock can have several different combinations at one time, the number of combinations vary by manufacturer and series. The advantage to a combination lock is the ability to change the user code regularly. Most electronic combination locks rely on batteries or a power supply; however, there are now electronic combination locks available that do not require batteries. There are many different types of plates available to strengthen, cover, or convert the existing door to a new style or function of lock. Many latch guards are also available to secure the space between the door and frame, so the latch is not vulnerable to attack. 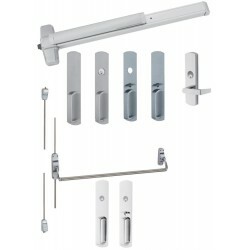 Including Wrap-Around Plates, Door Edge Reinforcer, Latch Guards, Filler & Conversion Plates, Scar Plates, Hole-Filler Plates, Extended Lip and Long Strikes, Deadbolt Security Strikes, Push/Pull Plates, Kick Plates, Flush Bolts, Cabinet Elbow Catches, Cylinder Pulls, Cast Wall Stops, and Floor Stops. The Detex Exit Alarm reduces internal and external customer theft. They are attack resistant, and withstand over 2200 lbs. of outside pull force. The have a 1” throw saw resistant dead bolt, and feature a 100 decibel alarm, powered by a 9V battery. The alarm is armed and disarmed by locking and unlocking the dead bolt. 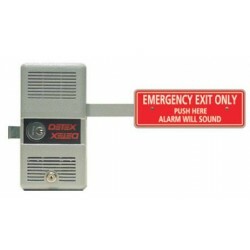 The Sargent Grade 1 Series Rim Exit Device is a multi-function rim exit device for 1¾” thick wood or metal doors. They have a ¾” stainless steel throw latch bolt, and have the allen key dogging feature to allow the door to be “dogged” open if required. Several different types of trim pieces may be used including levers.